Discover Main Street and “Small Business Saturday” received some good media publicity and support leading up to, and during, the event on November 29th. Buffalo radio station WBFO aired a piece on Discover Main Street and Small Business Saturday. They interviewed Noel Dill of Discover Main Street about the significance of supporting small businesses, the Discover Main Street initiative and Small Business Saturday. An article about the interview appeared on the radio station’s website. YNN News interviews Noel Dill of Discover Main Street. 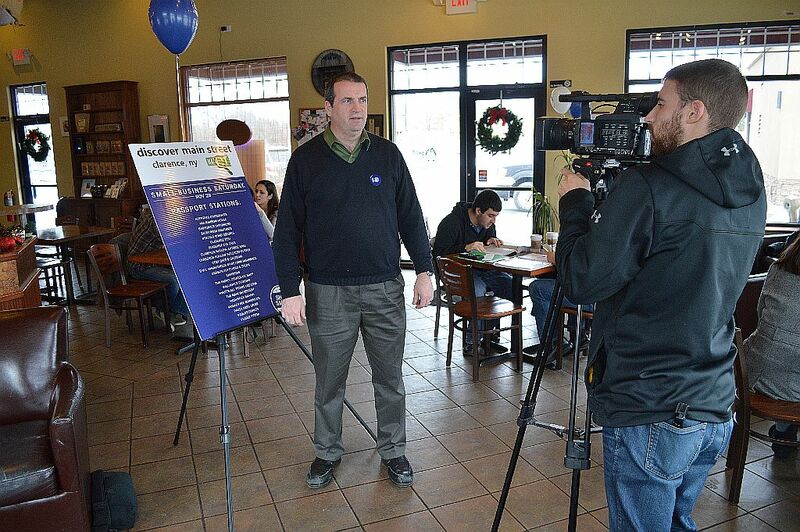 On Saturday, Time Warner’s YNN News came out to Goodrich Coffee & Tea to interview Noel Dill about “Small Business Saturday. The TV station then visited Monkey See, Monkey Do Children’s Bookstore and interviewed Kim Krug. The Clarence Sun weekly newspaper came onboard as a marketing partner for the “Small Business Saturday” event. The newspaper created a special centerfold of the newspaper that featured advertising from all the stores participating in “Small Business Saturday.” The Sun’s Cari Gavin was very instrumental in assembling the passport program. Previous Previous post: Small Business Saturday wrap-up!